We have put together a brief overview of the latest news and product announcements from this year's NAB Show. Enjoy! The new AMIRA Software Update Package (SUP) 5.0 further refines the camera's Multicam mode - a flexible, open interface for multi-camera broadcast applications. ARRI introduces a built-in wireless video transmitter in the newest model ALEXA SXT W, a significant upgrade reflecting ARRI's commitment to continually improve the ALEXA SXT platform. Blackmagic Design announced a new open protocol for URSA Mini Pro cameras that will allow customers to create their own remote control solutions via Bluetooth. Canon have added C-Log recording to the 5D Mark IV DSLR. This new paid upgrade for EOS 5D Mk IV users, is available exclusively from Canon-authorised service centres. Canon announced the launch of their latest compact cine-servo lens - the CN-E70-200mm T4.4 L IS KAS S. Designed for professional and advanced amateur videographers using large-format, single-sensor cameras. Canon announced a firmware upgrade for three of its professional 4K displays, the DP-V1710, DP-V2410 and DP-V2420. The new features include enhanced connectivity with digital cinema cameras and greater convenience when confirming images during High Dynamic Range (HDR) shooting, greatly improving on-location workflows. 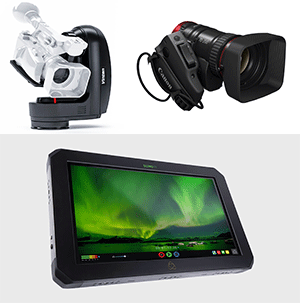 Atomos once again redefines the workflow options for video creatives by creating the first production/studio monitor to combine a 19" HDR 1200nit 10+ stop panel with 4K 12bit Raw or 10bit 422 ProRes/DNxHR recording and HD recording up to 240p or live switching and recording of four 1080p60 channels. JVC Professional announced new upgrades to their GY-HM850 and GY-HM890 cameras so they include integrated IFB channels. The Vinten Vantage is a lightweight remote head which can be tightly integrated into your existing studio setup. The Vantage is a robotic PTZ (Pan - Tilt - Zoom) head which aims for lighter camera setups up to 4.5 kg (approx. 10 lbs). It is capable of + or -90deg tilt range and 355deg pan range at a speed of 0.02 up to 60 deg/s. The HDRC-4000 HDR production converter unit provides simultaneous real-time streams for multi-purpose 4K HDR (High Dynamic Range) live production as part of powerful Sony SR Live for HDR workflows. AJA Video Systems announced new firmware for its KONA IP desktop video and audio I/O card, along with two new IP Mini-Converters, significantly expanding flexibility in IP-based workflows.